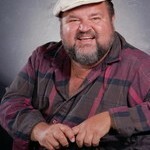 Today we mark the passing of one of the world’s great funny men, Mr. Dom DeLuise. From zany appearances with Johnny Carson on The Tonight Show and movies like Spaceballs and Robin Hood Men In Tights to more serious work like the opera Der Fleidermaus, Dom did everything with passion, including cooking. 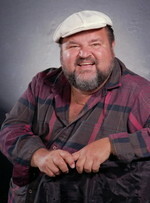 With more than a passing resemblance to Paul Prudhomme, Dom was an avid cook and author and penned several cookbooks including Eat This , Eat This Too , and Eat This Again . His special mix of affability and comedy will be missed. Boil potatoes until tender, drain and reserve. Return the pot to the stove top over medium heat. Add butter and bananas to the pot. Cook bananas 5 minutes and add the juice of 1 orange to the pot, reserve the zest. Allow the juice to cook out, 1 minute. Add potatoes to the pot and the stock and sugar. Mash potatoes, banana, stock and sugar together until well combined. Season with nutmeg, salt, pepper and orange zest, to your taste. Mash to combine spices and serve.